Southwest Virginia is loaded with adventure potential, drawing outdoor lovers of all kinds. But for climbers, the region is truly special. Blessed with some of the state’s premier climbing areas, southwest Virginia is also peppered with secret spaces and newly re-opened treasures, like the Hidden Valley Climbing Area. Options are abundant for climbers of all styles and skill sets. Adding to the appeal, the region is also infused with a rich cultural tradition, providing plenty of post-climbing perks, from bluegrass jam sessions to scrumptious craft brews. Here are 10 reasons why Southwest Virginia needs to be on every climber’s go-to list. Known for the free-roaming ponies wandering its lofty meadows, Grayson Highlands is possibly the most climber-friendly state park in Virginia—and arguably the premier bouldering destination in the state. Loaded with nearly 1,000 problems, the park’s routes are scattered among three main boulder fields—the Listening Rock Trail Loop, the Boneyard Area, and the Highlands Bouldering Area—and throughout several smaller areas. The bulk of the park’s boulders are located above 4,900-feet, making them climbable even in the summer. Some of the park’s most coveted climbs are also among the most accessible, like the routes along the Split Rock Trail. The first official bouldering trail in the state, the Split Rock Trail begins at the park office and links the Contact Station and Alchemy boulders, providing access to nearly 60 routes. You’ll even find tent-side boulders accessible from the park’s campground. To accommodate climbers, the park also rents crash pads, chalk bags, and brushes. Without a doubt, the most comprehensive climbing guide is Aaron Parlier’s Grayson Highlands Bouldering Guide. After being closed for nearly a decade, the beloved Hidden Valley Climbing Area reopened in 2014 thanks to the joint efforts of the Access Fund and the Carolina Climbers Coalition. Defined by a towering band of sandstone rising to heights of nearly 70-feet, the Hidden Valley Climbing Area offers primarily face climbing, the bulk of which are sport climbs, sprinkled with some trad and mixed routes. Since the reopening, Gus Glitch has written a guidebook, Hidden Valley Rock Climbs, highlighting nearly 500 different routes. Today, the area is accessible by permit, and parking is available in the Carolina Climbers Coalition lot. The climbing area is also adjacent to Hidden Valley Lake and the Hidden Valley Wildlife Management Area), making it easy to enjoy a hike on the Brumley Mountain Trail or a fishing trip on 61-acre lake. Tucked away on a lofty stretch of ridgeline atop Big Walker Mountain, in a sliver of the Thomas Jefferson National Forest outside the community of Atkins, the Atkins Boulderfield is an easily accessible conglomeration of nearly 67 climbs (the bulk being V4-V5). There are actually four different climbing areas sprinkled over the mountain’s saddle: the Roadside Boulders, the Drop, Hidden Heights, and the Atkins Wall. Climbers will find a diversity of challenges, from cliff bands to clusters of blocks and boulders. 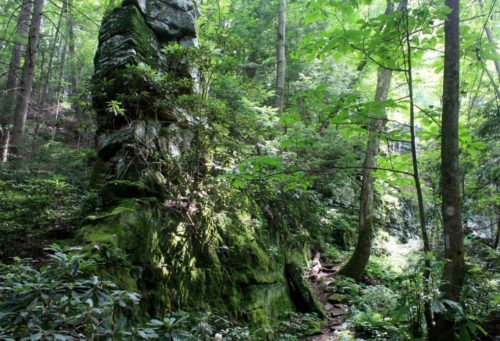 Just 10-miles west of the bouldering area is Hungry Mother State Park, featuring a picturesque 105-acre lake and 17 miles of trails, providing the perfect stop for a leg-stretcher either before or after a climbing stint. Straddling the border of Virginia and Kentucky, Breaks Interstate Park is one of the Southeast’s most singular recreation areas. The park is home to the honorary "Grand Canyon of the South," a wonder carved by the Russell Fork River and framed by grey sandstone walls reminiscent of West Virginia’s New River Gorge. While the potential of “the Breaks” has long been known to stone-seeking locals, climbing was off-limits until last May, when after the efforts of the Access Fund, the Southwest Virginia Climbers Coalition, and local climber Kylie Schmidt, the park opened several areas to climbing and new development, including Pinnacle Rock, Satellite Overlook, the Notches, Prospector Trail, the Pavilion, and Grey Wall. There are currently about 75 routes established in the park, offering a mix of sport and trad routes (the bulk within the 5.9-5.12 range). For warm-weather visitors, even during the height of summer, the park’s climbing routes are conveniently shaded by bands of old-growth forest. Featuring nearly 200 routes in just three miles, the Guest River Gorge combines a stunning hike with a bounty of climbing opportunities. The gorge features plenty of sport and trad options, plus an abundance of blocks and boulders, all accessible courtesy of a converted rail-trail paralleling the Guest River—one of Virginia’s Scenic Rivers. The very first mile of the hike is peppered with nearly a half-dozen boulders, allowing for a drawn out warm-up. The Guest River Gorge rail-trail is also sprinkled with pieces of local history, like the coal train tunnel still adorning the route. Cap off a day of climbing with a local microbrew at the Wolf Hills Brewing Company in Abingdon. The purveyor offers a rotating seasonal selection, including adventure-inspired beers—like the Creeper Trail Amber Ale and the White Blaze Honey Cream Ale. Beyond just beers, Wolf Hills Brewing Company also features nightly entertainment, from live music to trivia, and even a Tacos and Troubadours Night every Tuesday. Beyond outdoor adventure, Southwest Virginia is a region with a rich cultural heritage infused with a vibrant musical tradition. The 330-mile Crooked Road Music Trail celebrates this musical heritage, linking performance venues, local artists, and roadside exhibits. One of the trail’s highlights is the Heartwood in Abingdon, offering live music every Thursday, including occasional open jam sessions, and serving up a special barbecue menu on show nights. Or head to Abingdon’s Barter Theatre, another local institution. Established in 1933, the Barter managed to draw audiences despite opening during the Great Depression, and it has hosted performers like Gregory Peck, Patricia Neal, and Kevin Spacey. The theatre still showcases weekly performances on two stages. After a day of climbing, crash at one of Southwest Virginia’s stunning campgrounds that are abundant in the mountain-crowned corner of the state. The 200,000-acre Mount Rogers National Recreation Area is scattered with 11 different campgrounds, with options like the lake-studded Beartree Recreation Area or the Raccoon Branch Campground, adjacent to the Raccoon Branch Wilderness. For solitude, serenity, and wandering wildlife, set up camp beside Big Tumbling Creek, which is punctuated with plenty rushing falls and deep pools. Rather have four walls and a roof? The Forest Service also rents three cabins in the Mount Rogers National Recreation Area, or grab one of the cottages along Virginia Creeper Trail in Abingdon from Cottages on the Creeper or Crooked Cabin Properties. Climbing isn’t the only way to spend time outdoors in Southwest Virginia. The area is home to one of the most stunning segments of the entire Appalachian Trail—the 60-miles meandering through the high-country of the Mount Rogers National Recreation Area. You’ll also find a plethora of paddling opportunities, including the North Fork of the Holston River, the biodiversity-rich Clinch River, and the stunningly wild 330-acre Laurel Bed Lake. The 34-mile Virginia Creeper Trail isn’t just one of the most stunning rail-trails in the state—the historic thoroughfare is also a portal to nearly two dozen trailside climbing routes. Running from Abingdon to Whitetop Station, the Virginia Creeper is famously strewn with trout-fishing spots along Whitetop Laurel Creek and is peppered with a handful enticing boulders. Trailside opportunities include everything from easier climbs like the Creeper Slab (V0), looming directly beside the trail between Green Cove and Whitetop Station, to more challenging options like the John Henry Wall (featuring V1 and V4 routes). Grab a bike at the Virginia Creeper Trail Bike Shop in Abingdon. Trekking on the AT with @kateface1! Thanks for sharing with us!